Welcome to our 12th issue of PNM! Issue 12 marks the one year anniversary of PNM in print! Our first ever print issue was our Aug/Sept issue last year which featured Pikmin 3 on the cover. I don’t think anyone from our staff guessed it would be one year later before Pikmin 3 released but here we are. 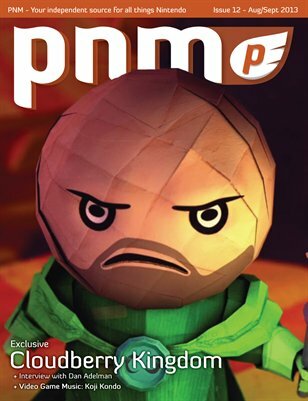 We have several exciting features in this issue including an extensive look at Cloudberry Kingdom from concept to final product, an interview with Dan Adelman of Nintendo of America, an interview with the team behind Spin the Bottle: Bumpie’s Party, our first Video Game Music article, and much more. Also, be sure to check out our full review of Pikmin 3. Hint: It’s the next must-have Wii U game.